It’s here. It’s here. This week’s episode begins with our brand new theme song, Adelaidee Hoo. It is version one of the song and after the summer break we are considering re-voicing it with some other Adelaideans so that it is something to waft through crowded pubs as the bells for last drinks ring out around the city. You can hear the full track, below. We toast Queen Adelaide with a Lady Bay Tempranillo before welcoming FIVEaa listeners who have joined us for the first time after Steve’s chat with Andrew Reimer last Sunday night. Colin takes us back into our own memories for Adelaide’s Yesterdays this week, with recollections of family cars, TV shows, home music collections and TV commercials. Did someone say, sing one? The Adelaide Visa Council has a celebrity before it with Andrew Reimer on the stand, along with some enterprising South Australians and an expat jazz musician caught putting Adelaide down on the other side of the world. enter bushfire season. Make sure you listen right through or skip to Wangary at the end of the show. Shout outs: Steve sends a cheerio to our new FIVEaa listeners, Jessica in New York who is an Adelaidean who started following us on Twitter this week, and his sister, Cheryn, who was not mentioned in the pageant show last week despite having been in it before. Colin has cheerios for his litte besties, AJ and Caitlin. 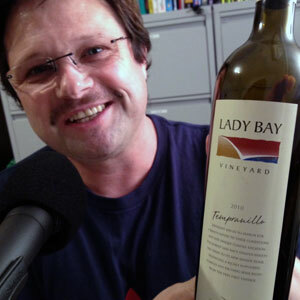 Wine tasting: We had a 2010 Tempranillo from Lady Bay Vineyard at Yankalilla in the Southern Fleurieu wine region. Gorgeous. Tasting notes. Stories without notice: Steve shared the South Australian Government’s AdelaideFree WiFi App Development Competition. He also encouraged everyone to donate to our fourth show presenter, Nigel Hobson-Keefe’s efforts to raise money for Brain Cancer research. Colin recounts a story from what we will now call Pluckers’ Corner. And Brett talks about new showcase opportunities for South Australian singers and songwriters. Click to read the judgements from hearing 011. Adelaide’s Yesterdays with Colin: Reminiscing on childhood memories of Adelaide, particularly family cars, record collections, TV shows and TV ads. Brett’s Musical Pilgrimage: Sun Theory and Black Days. Adelaidee Hoo Theme: If you are really game, you can listen to the whole version of the theme song here.